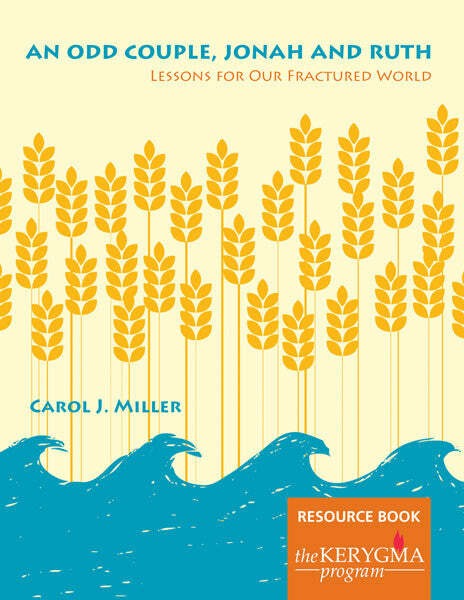 Resource Book by Carol J. Miller. A Resource Book is recommended for each participant. Large print edition also available. BIG IDEAS in small book has a new release with another 2-in-1 thematic Bible study which examines God's love for the outsider ... sometimes even the enemy. THE BOOKS — A comedy, a romance, both with Old Testament lessons for today! Jonah shows the original readers of the book, as well as us, what a picture of their bigotry and hatred of foreigners and enemies looks like to God. Ruth shows what life lived in performing deeds of hesed looks like to us and to God. JONAH - The book of Jonah uses the character of an outrageous excuse of a prophet to show the leaders and people of Judah just how foolish they looked with their insistence on isolationism and the exclusion of "the other." It asks the question, "If God loves the outsider, shouldn't we?" RUTH - The book of Ruth is an idealized story of what life would look like if God's people treated each other with His loving-kindness—insiders and outsiders alike. A key understanding in Ruth is that God uses these acts of the loving-kindness of people to demonstrate that which God gives to all, whether they realize it or not. - What Kind of Bible Story is This? - Naomi has a Plan! two studies with an overarching theme exploring our response to the stranger in light of God's astounding desire to include outsiders.